I would dress myself a lot differently. 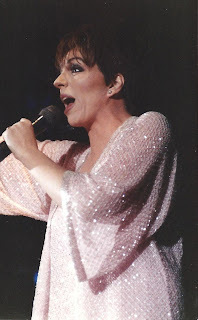 I'd also teach myself how to do an awesome Cher impression--much like this...but I digress. After I mentioned how incredibly awkward I was a young child (and ok maybe now) I thought I'd investigate a little deeper into the true weirdness of my youth and boyyyy did I find some goodies. 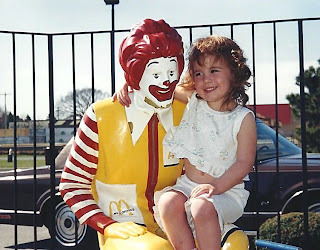 Here I can be seen with my first true love. He was an older man and a ginger. I think that his silence and constant fake grin really put an end to our relationship. That's probably why I feel about gingers the way that I do. Even though our love ended I knew I would always support his fight against the Hamburglar. That was also the last time I was able to get away with a belly shirt. Trust me I've tried. Here's when things start getting icky. 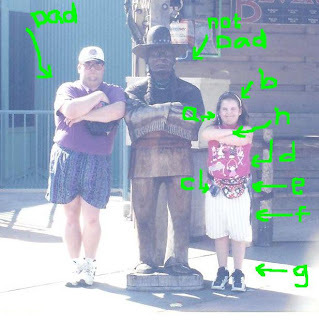 I broke it down for you by lettering the problems. a. Hair wrap- In my defense it was Disney World. I was seven. c. Plaid Kurt Cobain (ish) shirt tied around my waist- I don't know if you can truly make it out but it is fact there. I'm not sure why I found it necessary to bring a plaid shirt with me during a day in Orlando Florida but I did what I wanted. d. Cat Shirt- Ok this may be my favorite thing to describe. This shirt is not only pink but filled with cats doing random activities. One of them being jump rope. Another being high tea. e. Mickey Mouse Fanny Pack- Goes nicely with my plaid AND cat shirt. Such a fashionista. After all where else was I supposed to put my pen and mini autograph book? PLUTO AND MICKEY COULD COME AROUND THE CORNER AT ANY MINUTE. f. Stripped Shorts?- I say shorts with a question mark only because they look like bloomers...or capri chef pants. g. My Nikes- Just to add a bit of class to the ensemble I guess I thought my Nikes were the finishing touch. Notice they are what most kids wore who played basketball. I didn't play because it involved too much running...but still wanted to keep up appearances. h. Cheetah Slap Bracelet- Because it was the 90s. Here I am on my birthday...at the end of November. 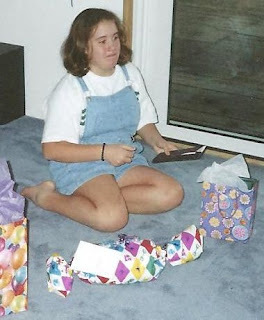 Why I thought short overalls were the best accessory for my party I'll never know. However overalls were my jam in middle and part of high school. Then someone asked if my tractor was parked outside and it was back to Adidas swishy pants. Those were also a staple in my wardrobe--I was a big "Space Jam" fan so I guess I felt like a Monstar when I ripped them off at the end of the day. I think everyone has pictures that were brutal growing up but I think they are fantastic. They are so embarassing yet 100% fabulous. Is Liza with a z related? I'm gonna Nancy Drew this mystery and get back to you. For now let your mind wander. Also if you want to become a follower of the blog you don't have to be signed up with Blogger so don't be scared. While you're at it you should become a follower of my friend April's blogs as well. She's cool and can cook and run. Two things I'm not capable of. So go here annnnd here! Jones... jsut wanted to say a quick thanks for doing this... its pretty damn fantastic... It almost inspires me to do one myself... but I think I would always be living in your blog's shadow. Dude, overalls were hot in middle school! I wore them on the first day of 6th grade with a striped turtleneck. I remember they were from the Limited Too, which I had decided was the coolest store EVER, so I was really excited about them. And I write a fashion blog, so I should know... and I'm putting the fact that I love overalls on the net...oh crap I'm going to lose all (16 of) my followers! !